I bought a 2000 pound bass boat package a few years ago, it is an heavy aluminum 17' boat with a 60 hp motor, 56" wide bottom and 83" beam. This is not a small boat, and is quite heavy when you add three batteries, gas, gear, coolers, trailer, and maybe even a full livewell. It did NOT tow okay with an Isuzu Rodeo V6, not at all! Not wanting to make the V6 mistake again, I naturally went and bought a Tundra V8. I went with the Access Cab because of the occasional need for a back seat. The Tundra is the first V8 I've had in awhile and tows my boat wonderfully! So, I'm talking to a guy and he says "you should have just bought a Taco DC longbed V6, it would tow your boat just as well....blah blah blah...and get better gas mileage." and he quoted that the 4785 lb Tundra has almost equal weight to HP and weight to torque numbers as the Taco. So I get to thinking about it and a bit of buyer's remorse starts sinking in...is it possible that the Tacoma could pull my boat as confidently as the Tundra? Am I wasting money on gas to run a V8 when a Taco would have been just as good at towing? Boy that's close. But I figure I need to add the boat into those figures. Just cause 266 ft/lb of torque gets around a 4135 lb Taco just as well as 313 ft/lb of torque gets around a 4785 pound Tundra (or does it?) Doesn't mean the Taco would handle the extra 2000 pounds as well as the Tundra. Extreme example you could have 150 ft/lb torque in a 2000 pound car and you know it can't pull a 2000 pound boat!! Am I thinking right here? Anybody tow with both? Did I do the right thing going with the Tundra, when towing capacity was THE reason I switched rigs? (If I didn't have the boat, I'd be driving a V6 RAV4 Sport.) Really, I got the truck to tow the 2000 lb boat confidently. Did I buy the right truck? I think you are over-analizing the whole thing, anda Tacoma would tow that boat just fine. I would not consider a 17' aluminum boat, even with gear a heavy load on a Tacoma. Since you already have the Tundra, just keep it! It's a great truck! And of course, it will tow the boat even easier! I have a 05 Tacoma with the v6 and I towed the 1800 lb Uhaul trailer with no problems from Albuquerque to Charlotte, NC. Thats empty weight by the way, so you add in everything I owned at the time (clothes, tools, computer, laptop, books, desk, 2 bicycles, etc, etc). I only had to shift down a gear or two on the very steepest of climbs, including the climb East out of Albuquerque over the Sandia mountains, but I was still maintaining speed and passing people. Should it handle a 2000 lb boat? Definitely. The Tacoma does have a 6500 lb towing cap. Too bad I didnt weight the total weight of everything, which would settle down the arguments of the nah sayers, who seem to be only Tundra owners. If I had to tow close to the max weight all the time I would probably go with a Tundra, but at 2000 lbs its no where near the max. And I'd much rather have the better gas mileage of the v6 Tacoma over the v8 Tundra. Ok, here's my take on this issue: Power wise, yes, they would pull hills about equally, (tundra a little better on long grades due to tq), however about the same all things considered power wise. The part you can't add in is the chassis value. The larger chassis will handle a good bit better (though the taco does amazing) - the tundra will be a more stable tow rig - if you were near max weights. At 2000 lbs, either truck would/should tow it effortlessly. I towed 5000+ lbs (my cj + trailer) 300 miles the other day with my 2006 taco. It towed fairly well- maintained 55 on several different long & steep grades in NY state. I had a 2004 Tundra and now have a 2005 Tacoma Short bed 4 door V6 Auto. I towed a 5k lb trailer with both with no problems. The Tundra advantage was with it brakes and extra weight helped handle the heavy loads safer IMO. The 04 Tundra had a 4 speed auto while the Taco has a 5 speed auto. This actually helps the Taco find a better gear ratio for towing a heavy load on rolling hills and such. Your 06 should have the 5 speed so you would not recognize that advantage. 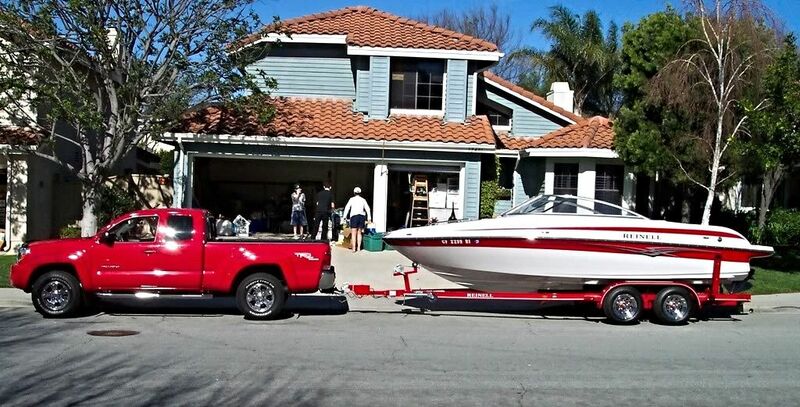 Your boat is not much of a load for either truck. I traded for the Taco primarily because my job changed and I needed a smaller vehicle for parking and fuel economy. I get about 16 MPG pulling a 12 ft single axle cargo trailer that weighs about 2500 lbs loaded. The Tundra got about 13 MPG with the same load. Towing the camper the Tundra only got about 9 MPG and the Taco got 13 MPG. Empty the Tundra got about 16 or 17 MPG average and my Taco now does 21 to 23. The Taco is a lot faster empty in a drag race. GTeck Pro showed 0-60 times at 8.1 Tundra and 6.9 for the Taco. I have a couple of friends with new Tacos and they have the TRD package. It seems that the larger tires on the TRD package hurts gas mileage significantly. They are both about 2 MPG less than me. I have confirmed Odometer readings to be correct with a GPS, so it is real numbers. I practically live in my truck and put about 150 miles per day on it. I check the mileage on every tank of gas and it only varies when the weather is real cold and I warm up in morning. The Tundra is a much more refined vehicle though and nothing else is a smooth or quiet inside. My 80 year old parents can't believe its a truck when they ride in the back. If you can afford the gas keep the Tundra. I have a 2006 Taco & my Wife a 2004 Tundra. Both 4WD. We pull a trailer with a polaris ranger several times a week. Loaded the traler is 2500- 2800 lbs. The taco pulls it great ,but it kills me in the gas mileage. My taco will get 20 mpg on the hwy all day long,but when I put the trailer behind it my mileage drops to 13 mpg. I can tell the trailer is back there while towing. With the tundra we get the same mileage towing ,but 4 mpg less unloaded. The tundra pulls the trailer better IMO. Less slowdown on hills & I can't tell the trailer is back there. If I were you I would keep the Tundra. I pull a 17' Stratos with a 115hp with my Prerunner 4 cyl. It's kind of sluggish on hills, but I would think it would do just fine with a 17' aluminum boat with a 60 on it. First off, I'm no expert but I would make sure my Tacoma has enough torque. Pulling a boat out of water certainly requires more torque. Were do you plan to put the boat in and pull it out? You have more resistance to overcome with boating: water, inclined landings and variable surfaces. Water adds weigh and must be displaced to move the trailer/boat. Inclined landings can vary from slight to significant grades. Even the landing surface can range from sand to concrete. If the pull out of the water is easy, then any Tacoma should work. If the surface if the landing is poor, then a 4x4 may be required. If a alot of water must be displaced to get the boat out, then a Tundra is a better choice. Towing is all about force. Pulling and gravitational forces. Yes I will keep the Tundra. When it wears out I can rest assured there is always the Taco to fall back on since I can't stand the 07 Tundras!